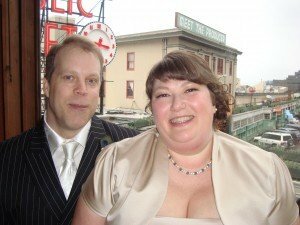 After15 Years Of Loving Relationship, A Sweet & Intimate Ceremony at Seattle’s Pike Place Market! February 20, 2013 at Pike Place Market. 2 teary witnesses. One happy Officiant. A celebration of 15+ years of loving relationship. When I first met Mary-Ann, she radiated an enthusiastic joy and happiness around her upcoming marriage to her beloved Dan. And at 3:00 p.m. on a Wednesday afternoon a few weeks ago, this fun-loving couple got hitched “Seattle Style” at a historic room over-looking Pike Place Market, with two teary witnesses and one happy Officiant! Dan and Mary-Ann: Bunny loving people! Devoted, private and so very much in love with one another. They giggle – trust me, I know this. They’ve shared much joy and unexpected challenges over their years together and their tiny and intimate ceremony at a meaningful Seattle venue was a true celebration of two people who are meant to be. Comments Off on After15 Years Of Loving Relationship, A Sweet & Intimate Ceremony at Seattle’s Pike Place Market!